Magpie roosts begin to build up from October reaching a peak mid-winter before breaking up in March as the breeding season begins in earnest. They tend to comprise birds from within the immediate local area. They are scavengers and a bit of a bully in the bird world so for many people their first sighting of Magpie is likely to be at the side of the road as the birds scavenge on roadkill, or as they try to balance on the bird feeders in the garden with much wing flapping and commotion. Like most ‘crows’ they are very intelligent and inquisitive and have been known to steal jewellery and other shiny objects, gaining a reputation as a thief. However they are also affectionate birds - I remember raising one as a child and rarely went anywhere without it on my shoulder. It would come to call and had its own chatter of greeting and welcome unlike any other of its wild siblings. Although all these songs and rhymes are most often associated with magpies, they can also be used to count other corvids such as Jackdaw, Raven and Crow. Not far from home in Newborough Forest, Anglesey, is the biggest Raven roost in Britain which at one time was the second largest in the world. Some 2000 birds at one time. That’s Awesome. The roosts appear to be dominated by juvenile and other non-breeding birds and are thought to act as an 'information exchange centre' to increase foraging success for birds lacking a territory. One of the most atmospheric winter wildlife experiences at Newborough is to witness the aerial acrobatics, vocalisations and behaviour of the hundreds of roosting ravens that make Newborough their winter home. A few weeks ago I was approached by the BBC who were interested in capturing some of that very atmosphere on camera for Winterwatch. As the largest raven roost on the planet, not only is Newborough one the best locations to film roosting ravens in terms of sheer number of birds but, thanks to the tireless work of eminent naturalist Nigel Brown, we also had scientific data and behavioural observations to better interpret what was actually going on within the roost. Though the wonders of modern technology on the shoot would reveal some unexpected raven facts. Our first task was to attempt to film feeding behaviour at a sheep carcass from a camera hide in Pant mawr. Though feeding on carrion is a natural instinct for ravens, these wily birds were reluctant to accommodate us! Being the highly intelligent and cautious birds that they are we had to be mindful of their ability to count people going in and out of the bird hide! Despite cameraman Neil Anderson’s best efforts to stay hidden in his hide for the best part of eight hours, and having entered in the dark, the birds were not fooled and not a single bird was seen feeding. Whilst Neil had been hunkered down in the hide at Pant mawr, and having left Nigel to investigate localities of roosting birds, we spent the afternoon capturing footage of ravens at play on the dunes at Penrhos. Onshore winds here create wind currents on the crest of the dunes that the ravens glide and tumble on, a bit of a playpark for ravens! Pairing displays characterised by aerial tumbling and distinct vocalisations were observed, signalling preparations for the fast approaching breeding season. With the beach shoot in the bag, we made our way to the main roost site at Cerrig Duon to prepare for the incoming birds at dusk. Cerrig Duon is on the highest point of the Precambrian rock ridge in the very centre of the site and provides the ravens with the best possible vantage point. Neil, having now abandoned the shoot at the carcass joined us and set up the Selex thermal vision camera in the hope of capturing interaction behaviour of returning birds. As birds arrived in dribs and drabs in the evening gloom the Selex camera gave us previously unseen views of the ravens in the roost preening and mooching about. It had always been thought that ravens, for reasons of protection and warmth, were roosting communally in tight family groups. What came as a surprise to us all, thanks to the Selex, was that, at least on this mild night, birds were some distance from each other deeper within the forest and apparently quite independent. The birds were also apparentlyd fonder of roosting in the more statuesque Monterey pines rather than the straighter telegraph pole Corsican pine. As the birds were coming in, Gary the sound man, using a parabolic sound device recorded an amazing diversity of vocalisations and calls which were reverberating around the roost. One of the unexpected highlights of the shoot came from the ravens’ smaller cousins, the jackdaws, which gave us a fine murmuration display above the roost, yelping and yapping as they squabbled and settled in for the night”. In the Autumn and Winter we have a small temporary or occasional roost, up to 30, of Raven in the Pines atop the old hill fort of Dinas Dinorwic which forms the backdrop to our view from the kitchen window. By late Winter these have dispersed leaving just a single breeding pair. 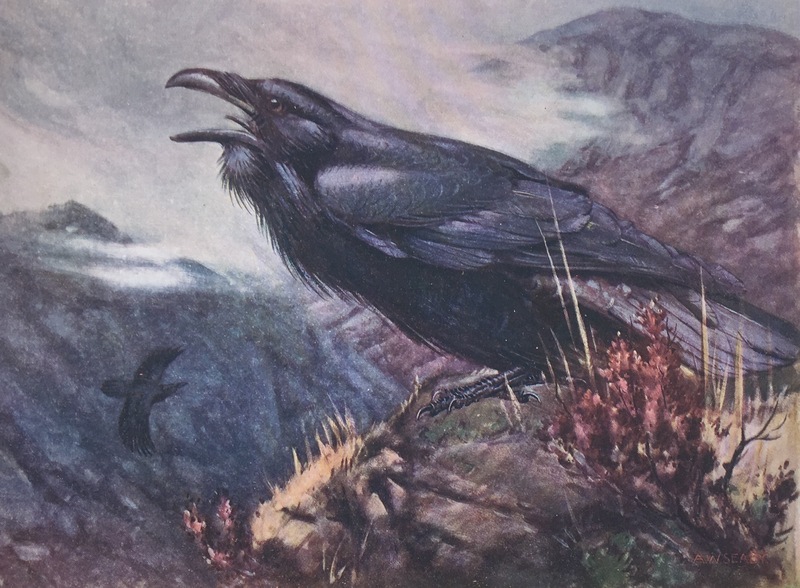 In the Iron Age and Roman period the Raven was present all over the British Isles. So this is probably an ancient site with Raven having bred there since pre Roman times. Just before dawn on November 12, 2017 after a cold wet night, the dogs surprised a Buzzard from somewhere very close by. Couldn’t see it – it was still too dark – but it flew off mewling. A Raven called nearby; and another .... and then with the Dawn, Raven came tumbling out of the Grey November skies ignoring the cold driving rain, sleet, and biting northerly winds. All day – at one time as many as 30 – they were engaged in aerobatic displays over the trees of the hill fort. Chasing, tumbling, sometimes soaring to quite a height, then falling only to shoot upwards again. Sometimes I thought they had gone but suddenly as if by magic they were there again. Some would settle in the pines for a bit before launching themselves again into the fun and games – for that’s what it seemed to be. ... Along the down, later in the week (September 2017), a wide chimney of ravens has formed, rotating in the updraft off the steep slope. We count twenty, then thirty; a handful of buzzards and kites spiralling up among them. The ravens pair up, mirror each other’s flight, rise to the top of the chimney, then dive, tumbling back down through the cooling tower of its centre. More birds arrive, and more; we count and recount, then spot others, so high as to be just pairs of simple black crosses, only the direction of flight indicating which end is which, their thick necks and long anvil beaks stuck out as much as their long diamond wedge tails. There are 50, 65, 70. They speak to each other in soft September ‘gowps’ and ‘cawps’ and we stand mesmerized, watching. A vortex of birds above the harvest, a dust devil of ravens. A season’s turning. Acrobatic starlings in the evening sky are another awesome sight. One of the best places still to see this is the Somerset Levels. Here, during the winter months, millions of starlings perform their nightly acrobatics, to the delight of hundreds of onlookers. Stephen Moss writing in the Guardian remembers seeing great clouds of starlings throughout the British countryside in the ‘60s and ‘70s and listening to vast flocks of them as they gathered on the window ledges of London's Leicester Square. Flock after flock after flock of Starling arrive, coming in from all directions to gather together in the skies above their roost site. As the numbers build, with some of the finest ‘murmurations’ (the name for a flying flock of starlings) reaching into the tens and hundreds of thousands of individuals, the flocks take on a life of their own, swirling back and forth overhead. No one wants to be the first to land, as there may be predators about. And indeed there will be: these large flocks attract hunting sparrowhawks and even peregrines, eager to pick a meal from the flock. The ever growing numbers, together with the occasion pass by a hunting raptor, leads to the flocks making amazing shapes in the sky, packing close together and then expanding out, one flock merges into another, zooming back and forth in ever more complex and beautiful patterns. It’s like that game of finding pictures in the clouds, only faster. And then, just as the numbers reach their peak and as the last of the light fades, as if by a secret signal, the birds suddenly decide the time is right and funnel down into the reeds. One last whoosh of wings, an electric chatter, and that’s your lot. Show’s over, the birds settle down to sleep and it’s time for you to head home. In the thick foliage of this belt of firs the starlings love to roost. If you should be passing along any road—east, north, west, or south —a mile or two distant, as the sun is sinking and evening approaching, suddenly there will come a rushing sound in the air overhead: it is a flock of starlings flying in their determined manner straight for the distant copse. From every direction these flocks converge upon it: some large, some composed only of a dozen birds, but all with the same intent. If the country chances to be open, the hedges low, and the spectator on a rise so as to see over some distance, he may observe several flights at the same time. 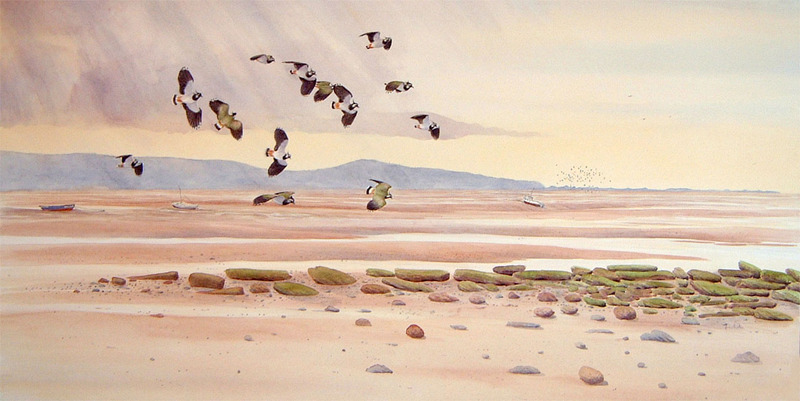 Rooks, in returning to roost, fly in long streams, starlings in numerous separate divisions. This is especially noticeable in summer, when the divisions are composed of fewer birds: in winter the starlings congregate in larger bodies. It would appear that after the young birds are able to fly they flock together in parties by themselves, the old birds clubbing together also, but all meeting at night. The parties of young birds are easily distinguished by their lighter colour. This may not be an invariable rule (for the birds to range themselves according to age), but it is the case frequently. Viewed from a spot three or four fields away, the copse in the evening seems to be overhung by a long dark cloud like a bar of mist, while the sky is clear and no dew is yet risen. The resemblance to a cloud is so perfect that any one—not thinking of such things—may for the time be deceived, and wonder why a cloud should descend and rest over that particular spot. Suddenly, the two ends of the extended black bar contract, and the middle swoops down in the shape of an inverted cone, much resembling a waterspout, and in a few seconds the cloud pours itself into the trees. Another minute and a black streak shoots upwards, spreads like smoke, parts in two, and wheels round back into the firs again. On approaching it this apparent cloud is found to consist of thousands of starlings, the noise of whose calling to each other is indescribable—the country folk call it a “ charm,” meaning a noise made up of innumerable lesser sounds, each interfering with the other. The vastness of these flocks is hardly credible until seen; in winter the bare trees on which they alight become suddenly quite black. ...... Well I had a grandstand view from my office window overlooking Plymouth Hoe one day as they were performing in a local air show. An awesome, spectacular, stunning, jaw dropping display - superlatives which equally apply to another display I watched from the same window one evening when working late - a constantly shifting, smokey, cloud-like murmuration of Starling over the Hoe with the backdrop of Smeatons Tower and the sea and sky merging in a purple haze on the distant horizon. Not a Large murmuration - probably only a few thousand birds - but their precision twists, turns rolls and synchronised formation flying left me in awe. Very interesting! I didn’t know about these other versions. The old children’s rhyme is rooted in superstition – you should also greet magpies when they are encountered in order to either allay bad luck or encourage good luck. Common greetings include ‘hello Mr Magpie’, ‘how is your wife/where is your wife?’ and ‘good morning/evening, sir’. I remember being taught to salute a lone magpie in order to show it respect, to touch my forelock or doff my cap!